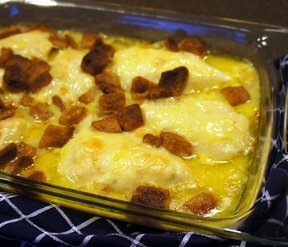 A simple weeknight dish that is creamy and cheesy, perfect for any chicken lovers. This is great served over rice or noodles or just with some crusty bread. 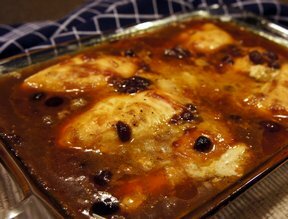 Layer chicken in casserole pan. Layer cheese over each piece. Mix soups with water and pour over chicken. Sprinkle croutons over all and then pour butter over all. Bake at 350° for 45 minutes, or until chicken is done. "My grandkids request this when they come for a visit. I don't mind since it is SO easy. 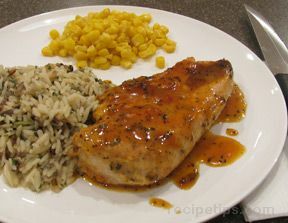 I usually to half chicken breasts and half thighs. 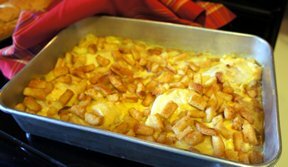 The croutons are so good since they are crisp on the top and kindof soggy on the bottom."